The market for cheese as a food ingredient has increased rapidly in recent years and now represents upto approximately 50% of cheese production in some countries. Volume II entitled Major Cheese Groups will focus on major cheese groups which is devoted to the characteristics of the principle families of cheese. 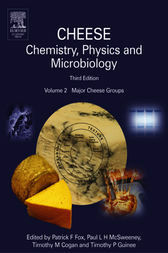 Cheese: Chemistry, Physics, and Microbiology Two-Volume Set, Third Edition is available for purchase as a set, and as well, so are the volumes individually.